The effects of introduced species are overwhelmingly negative. But are there cases where they might be beneficial? Blake et al. 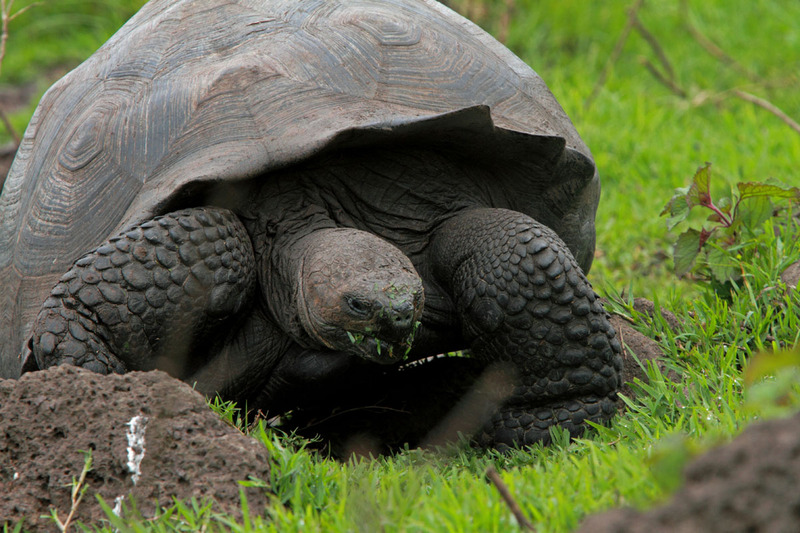 document the characterize diet composition of two species of Galapagos tortoises and investigate how introduced plant species on which they forage influence their conservation. In this month’s Editor’s Choice article, and the essay below, they explain how some transformed habitats that contain an abundance of introduced forage species – the kind of species ecologists typically want to remove as quickly as possible from ecosystems – are compatible with tortoise conservation. If you have more questions after reading the essay and paper, check out the website of the Galapagos Tortoise Movement Ecology Programme and their page on Facebook. Yum. A male tortoise (C. porter) feeding on the probably introduced Paspalum conjugatum (Photo by Christian Ziegler). 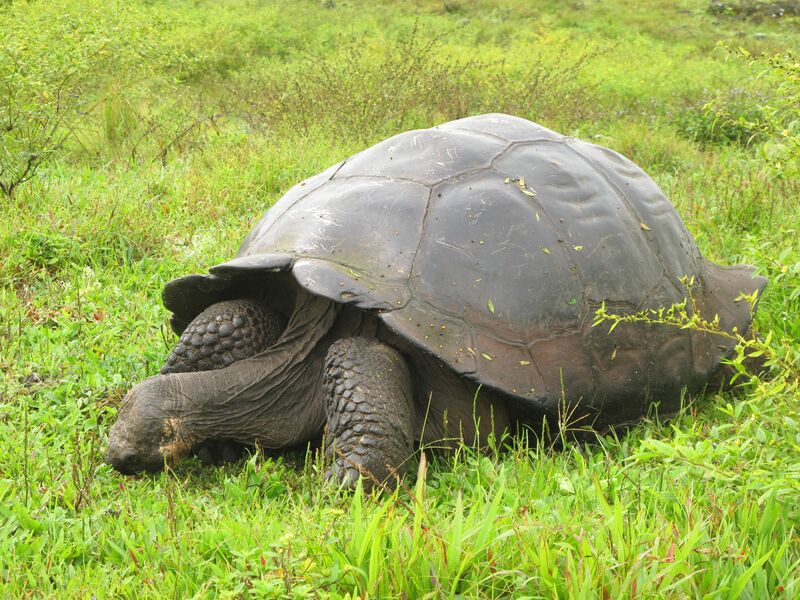 Galapagos giant tortoises are one of the great icons of the wonders of nature. It comes as a bit of a surprise, therefore, to learn that the ecology, life history and population biology of these creatures are not well understood. Three pioneering studies were undertaken in the 1970s and 1980s. In 1974 Craig MacFarland oversaw the first systematic survey of tortoises across the Archipelago and generated a blueprint for their conservation, while in the 1980s, Linda Cayot battled through El Niño floods the like of which had not been seen in 100 years to complete her PhD on tortoise foraging ecology on Santa Cruz and Pinzon Islands, while Lynn Fowler lived like a female Robinson Crusoe studying interactions between tortoises and donkeys on the remote Alcedo Volcano of Isabela Island. 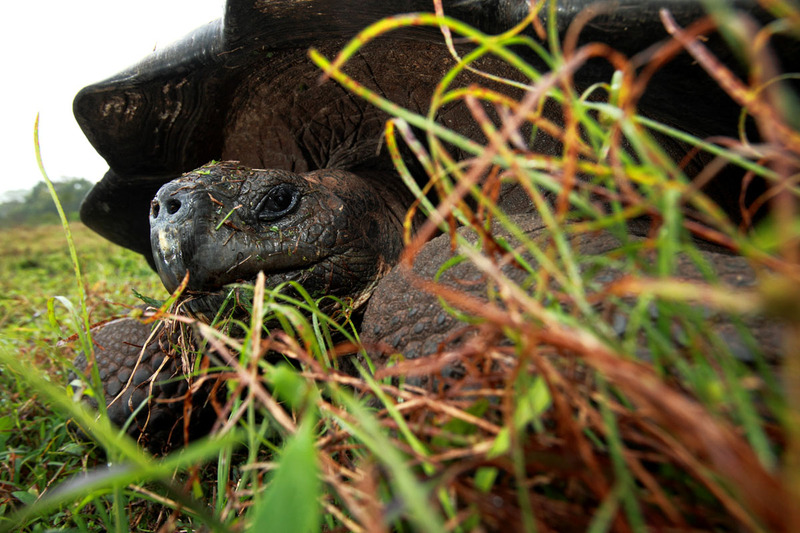 In the 1990s, Washington Tapia, a Galapagos resident, assessed population structure and distribution of tortoise on the remote Cerro Azul volcano of Isabela Island, again living like a hermit for 18 months. Unfortunately, like several other Masters degrees that have been completed by Ecuadorian students, his excellent work was not published in international journals nor widely disseminated outside a relatively small community. Thus remarkably little has been published on tortoise ecology, impeding both tortoise conservation as well as understanding tortoise impact on the larger environment within which they operate. Endemic Opuntia echios cacti are an important lowland food source for giant tortoises, particularly in the dry season. Here a young male from the Cerro Fatal populations tucks into a succulent cactus pad. The spines don’t seem to bother him Photo by Stephen Blake). In 2009, we were in the lucky position of being able to contribute to the science of tortoise ecology when we deployed GPS tags on 10 Galapagos tortoises in a project initiated by the Max Planck Institute for Ornithology, the Galapagos National Park Directorate, and the Charles Darwin Foundation. A ludicrous proposition – “do you really study tortoise movement?” we have heard many times – but on closer examination a gold mine of insights on animal migration. The data soon revealed that tortoises on Santa Cruz Island migrate from arid lowlands into humid highlands, in a pattern which appears to track vegetation productivity. This struck us as pretty odd – particularly since a large Galapagos tortoise can hunker down for over a year without eating or drinking – which incidentally enabled massive killing by whalers, pirates and other sailors who stored tortoises alive for months onboard ship; a form of fresh meat on long voyages. Why would a 250kg reptile who can fast for a year and who carries a heavy shell haul itself up and down a volcano in search of foods of the highest quality? Couldn’t it just wait out the dry season until better times come during the rains? Presumably, it all comes down to energetic tradeoffs, and what an animal puts in its mouth and swallows is a pretty important starting point for any study of ecological energetics. But we didn’t know what constituted the bulk of tortoise diet. 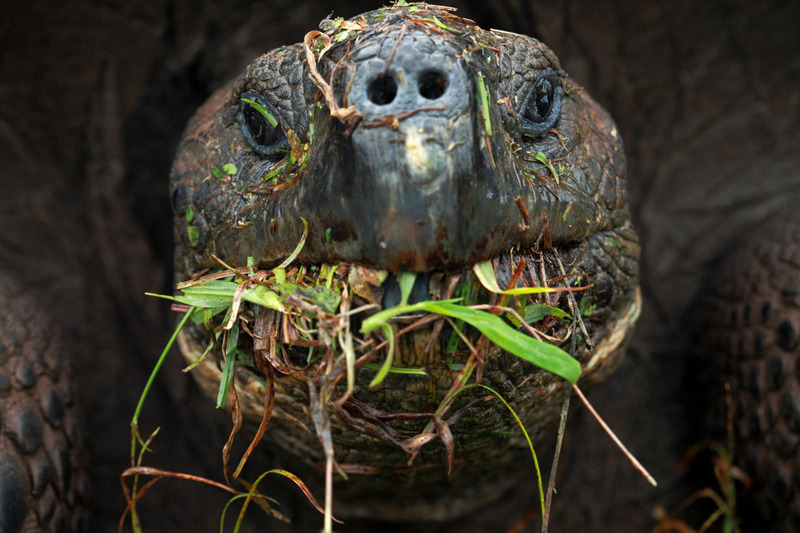 In particular, Linda Cayot’s dietary study had been conducted largely before the explosion of introduced and invasive species hit Galapagos including the main tortoise areas. 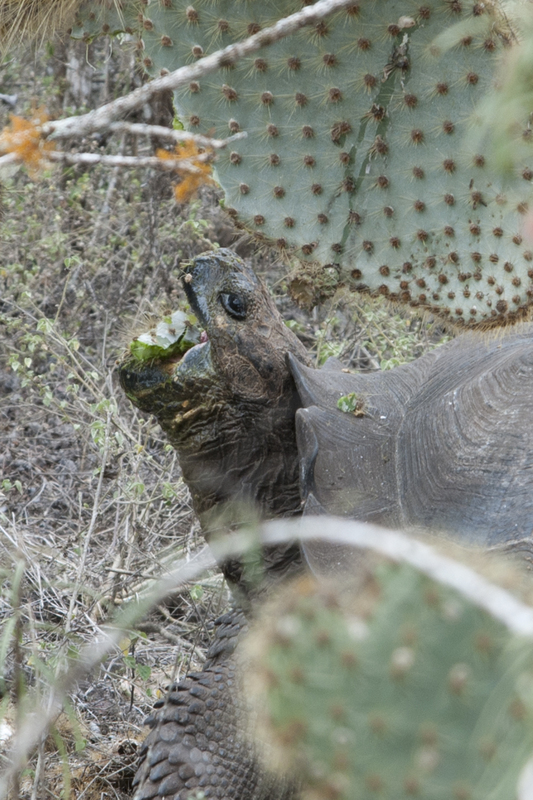 So we started following Galapagos tortoises on Santa Cruz Island, watching them and recording everything they ate in 10 minute periods of “focal animal observations”. This might seem like very primitive research in these days where complex mathematical modelling is de rigueur in ecology. But understanding the complexity of ecosystems has to start with answering some very basic questions – in our case, what do Galapagos tortoises eat, when, where and how much? And, of critical importance, what is the role of introduced species in the diet and, by implication, what role might tortoises play in facilitating invasion by exotic species in inhabited islands? 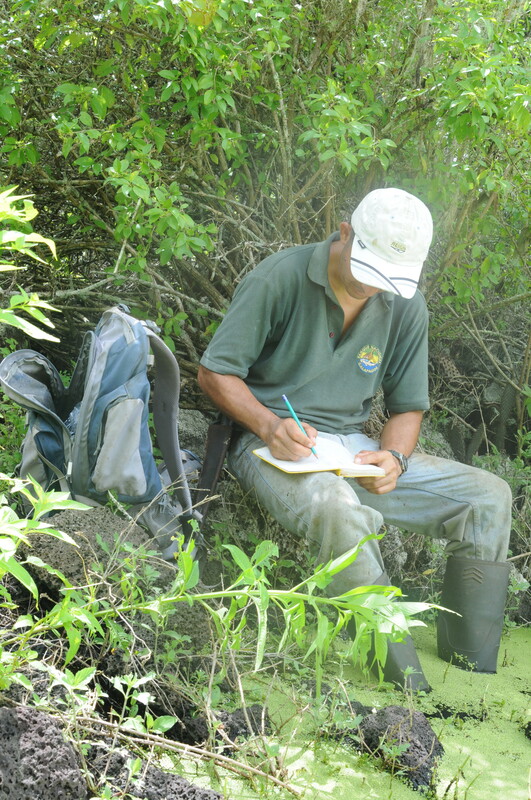 Research scientist, Fredy Cabrera, taking notes in knee deep flood water in the lowlands of Santa Cruz, near to Cerro Fatal. (Photo by Stephen Blake). 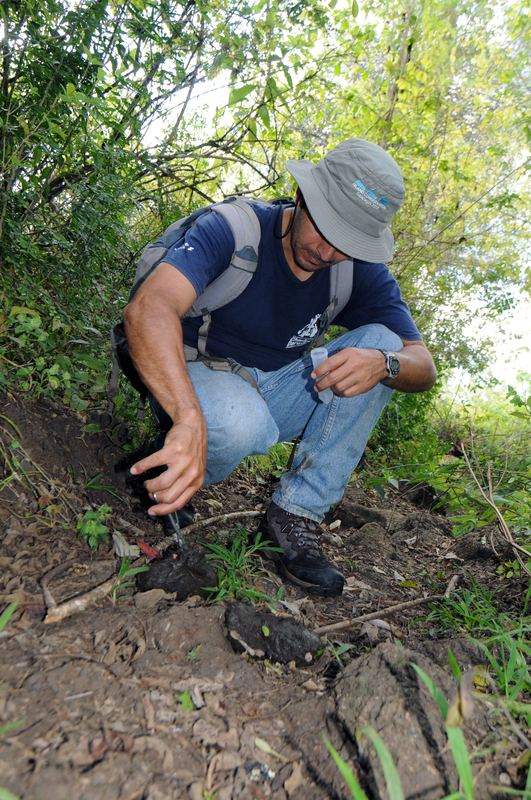 Fredy Cabrera begins to identify and count the seeds in a pile of tortoise dung. We have d counted over 6000 seeds in a single dung pile on some occasions (photo by S. Blake). We had already seen that tortoises consumed fruit from a wide variety of species, making them important seed dispersers, particularly of introduced species (Blake et al., 2012. Journal of Biogeography, 39(11) 1961-1972). Furthermore casual observations led us to believe that introduced species must be important in Santa Cruz tortoise diets because of the prolonged time tortoises spent in agricultural lands during the highland phase of their migration where these species dominate the vegetation. So we were not surprised that introduced species were an abundant part of the diet. The reasons why tortoises prefer many introduced species is also not difficult to understand. Consider the endemic guava, Psidium galapageium. This species produces small fruits, containing large seeds and a small amount of relatively bitter pulp in a thick exocarp. By contrast, the introduced guava, Psidium guajava, is large, containing abundant sweet pulp in a thin pliable exocarp. The adult trees grow in dense stands and produce enormous densities of fruits that fall to the ground. Why wouldn’t a large herbivore feast on such abundance? Presumably, for the same reasons, we humans prefer honey crisp apples over crab apples. Fredy Cabrera finds himself in some strange places as he tries to find our GPS tagged tortoises. 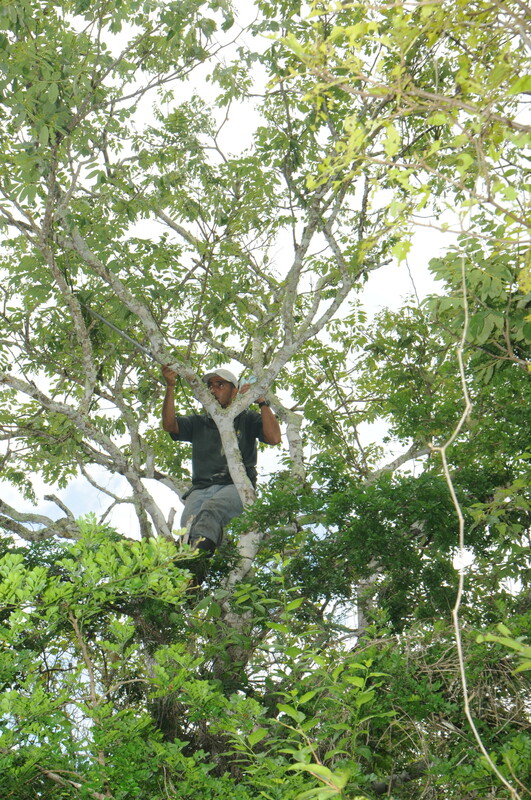 Here he had to climb a tree to get a radio signal from a tagged tortoise. (Photo by S. Blake). In this study, we have only scratched the surface of tortoise feeding ecology, and how it links to movement ecology and population dynamics. Perhaps the most interesting question to come from our work is how introduced species will modify tortoise nutritional state, energy balance, movement patterns, health and ultimately fitness? For example, is tortoise fitness increased on a diet dominated by introduced species compared to native species? What do introduced plant species mean for tortoise distribution and carrying capacity? Conversely, what role do tortoises play in the propagation of introduced versus native species through seed dispersal and selective herbivory? As we stood out there in the field racking up datum after datum, we had plenty of time to ponder these questions. Having published outcomes of this first inquiry, we are looking forward to many more hours in the Galapagos watching tortoises and answering the slew of questions their activity provokes. We hope too, that this work will contribute something real and tangible for the Galapagos National Park Service as they work to protect these iconic giants and their habitats in an iconic land. The authors sincerely thank the Galapagos National Park for all their help, encouragement, and technical, logistical and political support. They also most gratefully thank the United States National Science Foundation (Grant No. 1258062), the National Geographic Society Committee for Research and Exploration (Grant No. 8716-09), the Swiss Friends of Galapagos, and the Galapagos Conservation Trust. A large male in the highlands of “La Reserva” feeding on an abundance of Paspalum conjugatum (Photo by S. Blake). An adult male C. porter contemplates his next mouthful in the highlands of Santa Cruz (Photo by Christian Ziegler). An adult male tortoise from the “La Reserva” population (Chelonoidis porter) in the highlands of Santa Cruz Island feeding in a mixed species patch dominated by introduced species. (Photo by Christian Ziegler). Los efectos de las especies introducidas son abrumadoramente negativos. Pero hay casos en los que podrían ser beneficiosos? Blake et al. documentan la dieta característica de dos especies de tortugas de Galápagos e investigan las especies de plantas introducidas, la forma en la que se alimentan y como puede influir en su conservación. Este artículo escogido por los editores, y el ensayo de abajo, explican cómo algunos hábitats transformados que contienen una gran cantidad de especies de forrajeo introducidas – especies que los ecologistas normalmente quieren quitar lo más rápidamente posible de los ecosistemas – son compatibles con la conservación de las tortugas. Si tiene más preguntas después de leer el ensayo y el artículo, echa un vistazo a la página web del Programa de Ecología Movimiento Galápagos y su página en Facebook. Las tortugas gigantes de galápagos son uno de los grandes iconos de las maravillas de la naturaleza. Viene algo de sorpresa, por lo tanto, el enterarse de que la ecología, historia de vida y biología de la población de estas criaturas no son bien entendidos. Se realizaron tres estudios pioneros en los años 1970 y 1980. En 1974 Craig MacFarland supervisó el primer estudio sistemático de las tortugas en todo el Archipiélago y generó un plan para su conservación, mientras que en la década de 1980, Linda Cayot luchó contra la inundación de el El Niño mas grande, como no se había visto en 100 años, para completar su doctorado en ecología alimentaria de las tortugas en las islas Santa Cruz y Pinzón, mientras que Lynn Fowler vivió como una mujer Robinson Crusoe realizando su estudio sobre las interacciones entre las tortugas y burros en el remoto volcán Alcedo de la isla Isabela. En la década de 1990, Washington Tapia, un residente de Galápagos, evaluó la estructura y distribución de la población de tortugas en el volcán Cerro Azul de la isla Isabela, de nuevo viviendo como un ermitaño durante 18 meses. Por desgracia, al igual que varios otros másters que han sido completados por los estudiantes ecuatorianos, su excelente trabajo no se publicó en revistas internacionales ni fueron ampliamente difundidos fuera de una comunidad relativamente pequeña. Por lo tanto muy poco se ha publicado sobre la ecología de las tortugas, impidiendo tanto su conservación, así como la comprensión del impacto en el entorno más amplio en el que las tortugas operan. En 2009, estábamos en la afortunada posición de ser capaces de contribuir a la ciencia de la ecología de las tortugas cuando desplegamos geolocalizadores GPS en 10 tortugas de Galápagos en un proyecto iniciado por el Instituto Max Planck para la Ornitología, la Dirección del Parque Nacional Galápagos, y la fundación Charles Fundación Darwin. Una propuesta absurda – “¿de verdad estudian movimiento de tortugas?” Hemos escuchado muchas veces – pero resultando ser un un examen más, en una mina de oro de ideas sobre migración animal. Los datos de pronto revelaron que las tortugas en la isla de Santa Cruz migran de las tierras bajas áridas a tierras altas húmedas, en un patrón que aparece para darle un seguimiento a la productividad de la vegetación. Esto nos pareció bastante extraño – porque una gran tortuga de Galápagos puede atrincherarse durante más de un año sin comer ni beber – lo que por cierto ayudó a la matanza masiva que lograron los balleneros, piratas y otros marineros que almacenaban tortugas vivas durante meses a bordo de sus buques; una forma de carne fresca en los viajes largos. ¿Por qué un reptil de 250kg que tiene un pesado caparazón y que puede ayunar durante un año se mueve de arriba hacia abajo de un volcán en busca de alimentos de la más alta calidad? ¿No podría simplemente esperar a que pase la estación seca hasta que vengan tiempos mejores durante las lluvias? Es de suponer que todo se reduce a intercambios energéticos, y lo que un animal pone en su boca y traga es un punto de partida muy importante para cualquier estudio de la ecología energética. Pero aun no sabíamos lo que constituía la mayor parte de la dieta de las tortugas. En particular, porque el estudio de dieta que Linda Cayot había llevado a cabo, se realizó en gran parte antes de la explosión de especies introducidas e invasoras que golpeó a Galápagos, incluyendo las principales áreas de tortugas. Así que empezamos a seguir tortugas de Galápagos en la Isla Santa Cruz, observándolas y documentando todo lo que comían en períodos de 10 minutos de “observaciones focales”. Esto puede parecer una investigación muy primitiva en estos días donde el modelamiento matemático complejo es de rigor en la ecología. Pero la comprensión de la complejidad de los ecosistemas tiene que empezar con la respuesta a algunas preguntas muy básicas – en nuestro caso, ¿qué comen las tortugas de Galápagos, cuándo, dónde y cuánto? Y, de importancia crítica, ¿cuál es el papel de las especies introducidas en su dieta y, por implicación, el papel que las tortugas podrían desempeñar en la facilitación de la invasión de especies exóticas en las islas habitadas? Ya habíamos visto que las tortugas consumen fruta de una amplia variedad de especies, lo que los hace importantes dispersores de semillas, especialmente de especies introducidas (Blake et al., 2012. Revista de Biogeografía, 39 (11) 1961-1972). Además, observaciones casuales nos llevó a creer que las especies introducidas deben ser importantes en la dieta de tortugas de Santa Cruz debido a los largos períodos de tiempo que las tortugas pasan en la zona agrícola durante la fase de migración a las tierras altas, donde estas especies dominan la vegetación. Así que no nos sorprendió que las especies introducidas fueron una parte abundante de la dieta. Las razones por las que tortugas prefieren muchas especies introducidas no es tampoco difícil de entender. Considerando la guayaba endémica, Psidium galapageium. Esta especie produce pequeñas frutas, que contienen semillas grandes y una pequeña cantidad de pulpa relativamente amarga con un exocarpio de espeso. Por el contrario, la guayaba introducida, Psidium guajava, es grande, y contiene abundante pulpa dulce en un exocarpio flexible y delgado. Los árboles adultos crecen en masas densas y producen enormes densidades de frutos que caen al suelo. ¿Por qué no una gran fiesta herbívora con tanta abundancia? Es de suponer que, por las mismas razones, nosotros los humanos preferimos las manzanas crujientes de miel, sobre las manzanas de cangrejo. En este estudio, sólo hemos arañado la superficie de la ecología alimenticia de las tortugas, y cómo se relaciona con la ecología de movimiento y dinámica de la población. Tal vez la pregunta más interesante que debe venir de nuestro trabajo es cómo las especies introducidas modificarán el estado nutricional, el equilibrio de la energía, patrones de movimiento, la salud y en última instancia la salud de las tortugas? Por ejemplo, la salud de las tortugas aumentó cuando tuvieron una dieta dominada por especies introducidas en comparación con las especies nativas? ¿Qué significan las especies de plantas introducidas para la distribución de las tortugas y su capacidad de carga? A la inversa, ¿qué papel juegan las tortugas en la propagación de especies nativas versus introducidas a través de la dispersión de semillas y la herbivoría selectiva? Mientras estábamos ahí afuera en el campo acumulando datos después de datos, teníamos un montón de tiempo para reflexionar sobre estas preguntas. Tener resultados publicados luego de esta primera investigación, estamos muy motivados para seguir adelante con muchas más horas observando tortugas de galápagos, para responder la gran cantidad de preguntas que sus actividades provocan. Esperamos también que este trabajo contribuirá algo real y tangible para la Dirección del Parque Nacional Galápagos en su trabajo para proteger a estos gigantes emblemáticos y sus hábitats en una tierra icónica. ← Do you want to receive the printed version of @Biotropica in the mail? Here’s how.